Woah! Stuff everywhere. It was hard on the eyes, hard to find anything important, and not very inspirational. I deleted any shortcut icon for a program I rarely used. When you install these little programs they make themselves a shortcut for you. How convenient. Except I’m okay with clicking on the Start Menu, thank-you-very-much. If I need you, I’ll find you. I dragged any shortcut icons of programs I use on a regular basis down to the start menu task bar on the bottom of the screen. I rearranged them by type (iTunes and Spotify are both music programs, for instance,) and voila! Instant order! YES. Love it. I created a SORT! folder and dragged all icons of files that I wasn’t quite sure what to do with them into that file. Yes, it is delaying the inevitable, but the goal was to clean up the visual mess. I’ll get to the real digital organizing at a later date. I created a To Read folder for all the PDF downloads from great blogs I’ve visited. There are several downloads about growing your creative business that I really wanted to read, but just couldn’t see in all that mess. Now I know where to go for my reading material. 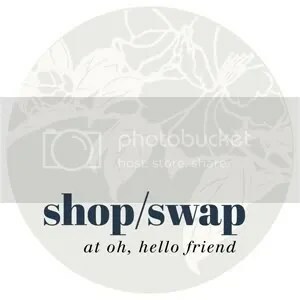 I kept the folders for our different businesses and this blog, so I had easy access to those files. I went to WallBase.cc (at Daniel’s recommendation) to find a good background to download. 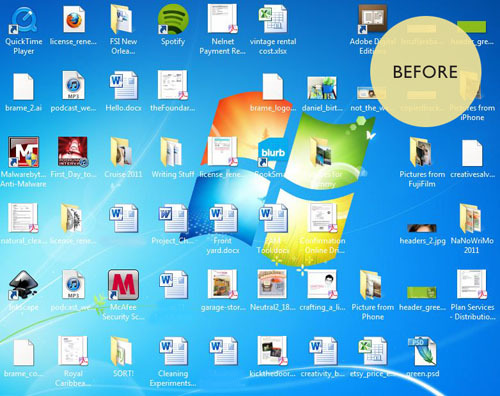 The one I chose really spoke to me and my purpose for cleaning up my desktop. I rearranged the folder icons and moved my Recycle Bin a bit to be visually-pleasing and in places that made sense. 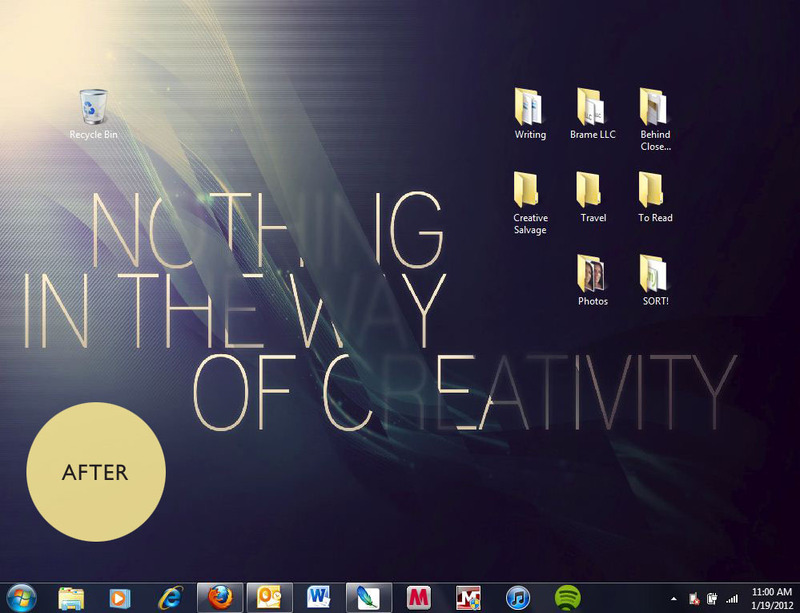 It’s a great feeling to have simplified my desktop. In fact, now I’m inspired to write more and read more of the many downloads I have stored away for future inspiration. I’m pleased with the result, and hope it will inspire you, as well! p.s. This is it! This is the last day to enter my book giveaway of the book Organize Now! plus an At-a-Glance daily planner. It closes at 9pm CST today. Don’t miss out! You can enter by commenting on this post. And if you’re new to my blog and would like to read more, start here, or subscribe via RSS! Thanks!